Undoubtedly, liter class motorcycles are the most preferred type of super bikes in our country. They have an amazing mix of power, style and handling capabilities, making them eligible for the lead role in most Bollywood and even Hollywood films. However, after getting all the praise for their extraordinary character, they are generally the priciest of all with premium components being used in their braking, suspension and electrical systems. BMW recently launched it's flagship racer, S1000RR in India for INR 19.20 lakh. This makes it a worthy competitor to Honda CBR1000RR, Suzuki GSX-R1000, Kawasaki ZX-10R and Yamaha YZF-R1. BMW made the deal even better by reducung the price to INR 17.90 Lakh recently! 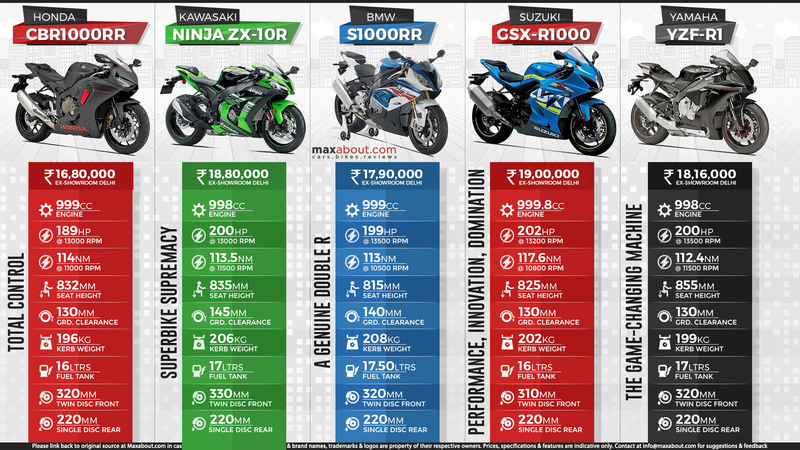 All of these are the best options for a buyer looking for a super bike in the range of around INR 20 lakh. BMW S1000RR is powered by a 999 cc engine producing 199 HP and 113 Nm of torque. The engine comes mated to a 6-speed gearbox while claimed top speed is 303 kmph. It is undoubtedly the most exclusive out of all the five bikes listed here. Not just that, it is the only European rival in the list as all others are Japanese by origin. Indian superbike market recently received the 2018 variants of both Suzuki GSX-R1000 and Honda CBR1000RR, both being more powerful and using much better equipment than their previous variants. Honda CBR1000RR is powered by a 999 cc engine that is good for 189 HP and 114 Nm of torque. Although it looks lesser powerful on paper, the low overall weight of just 196 kg makes it the lightest out of all in this list. It comes for INR 16.80 lakh and the price is ex-showroom Delhi. Suzuki GSX-R1000 costs INR 19 lakh and comes with a 999.8 cc, four cylinder engine producing 202 HP and 117.6 Nm of torque. It weighs 202 kg and claims a top speed of 300 kmph. Kawasaki Ninja ZX-10R is yet to receive a 2017 version. It is currently priced @ INR 18.80 lakh and gets a powerful 998 cc engine, producing 200 HP and 113.5 Nm. Yamaha YZF-R1 was placed at a wrong price of INR 24.74 lakh, making it considerably expensive in front of all other liter class bikes. But Yamaha recently launched the 2018 model and reduced the price tag in India! New R1 is available for INR 18.16 lakh in India. It comes with a 998 cc engine that is good for 200 HP and 112.4 Nm of torque. It weighs just 199 kg and claims a top speed of 299 kmph. All of these carry unique design lines and represent the best that is being offered on the road legal versions. Apart from these variants, all of them are being offered with race spec parts and track specific versions. Watch out this space for more super bike related infographics with one carrying all liter class motorcycles available in India in the works.